How to make wooden toy wheels using a circle cutter. Most of the time it is a lot easier to buy ready made wooden wheels, but there may be a reason that you will want to make your own. Who would have thought making a simple wooden disc would be such a challenge? As with most things in life, it is easy to do, but not so easy to do well. It's best to use a drill press and set the speed to no faster than 500 RPM. My experience with this tool leads me to believe it works best with soft woods like pine. I have tried it on other types of wood with mixed results. If this is the first time you are using this tool, I would suggest practicing on a piece of scrap. A circle cutter is designed to cut holes, but we want to use the leftover bit, that is the plug, to use as wheels. The cutters are shaped in such a way that it will leave a bevelled edge on the wheel. What I did was to grind the bevel of the circle cutter on the opposite side so that the wheel came out nice and smooth. It is important to remember safety first! I used a bench grinder while holding the cutter part of the tool firmly in a vise grip. All I need to do now is to bolt the wheel into the drill and sand the edges smooth. The photo shows a circle cutter in action. Note how the workpiece is clamped onto a piece of scrap. Keep well clear of those spinning arms, and be sure to use a slow speed setting. Most circle cutters and wheel cutters recommend a maximum speed of 500 rpm. With a nut and bolt to clamp the wheel in the drill, use a wood file to remove the bur and round off the edges. Use a small sanding belt for a smoother finish. For the final touch, plug the hole with a short length of dowel. 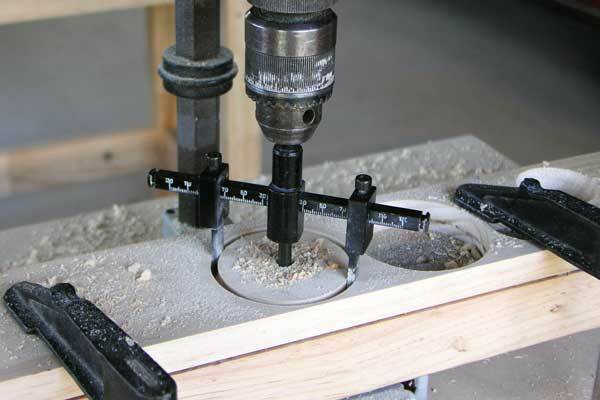 Using a simple jig as shown clamped in place, drill a shallow hole with a 16mm spade bit. A few things I have learned along the way. To fit the axle to the wheel I prefer a snug fit. To relieve the pressure on the wheel, cut a groove about 6mm (1/4") deep in each end of the axle. Make sure to cut along the grain rather than across it. Use a junior hacksaw. Fit the axle to the wheel, with the cut in the same direction as the grain. This tip serves two purposes, it minimises the tendency to split the wheel, and provides a tiny reservoir for the glue. Make washers from plastic milk bottles using a hollow punch. This will help to prevent the wheel rubbing against the body of the toy. Apply candle wax to the area of the axle that fits inside the body of the toy. How to make large wooden toy wheels using this very simple but effective woodworking jig. Making wooden toy wheels - from woodwork forums, how to make wagon type wheels. Spoke wheel jig for model makers, also from woodwork forums. How other toymakers make wooden wheels.